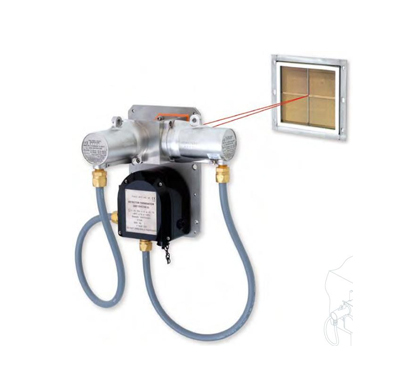 The Honeywell Analytics Searchline Excel Cross-Duct is a Hazardous Area certified infrared open path gas detector, for use in HVAC intakes and exhausts. There are 2 types: Short Range for ducts 0.5m - 2.5m width (ATEX and UL) and Long Range for ducts 2.5m - 5.0m width (ATEX ONLY). Hazardous area approvals include European (ATEX) and North American (UL). Receiver output is 3 wire 4-20mA selectable sink or source. Standard calibration is Methane (gas mixtures where Methane is the main constituent (>70%) and the balance is other hydrocarbons). The DX termination unit (UL only) provides convenient mounting and field wiring connections as well as an intrinsically safe connection socket for the Handheld Interrogator. Additionally, the DX termination unit (UL only) allows for a multi drop Modbus RS485 interface. The Handheld Interrogator is a commissioning / maintenance tool and is certified for use in hazardous areas. For direct connection to the Excel system, the SHC protection device module must be used. It is important to ensure the suitability of an application for Excel Cross-Duct before ordering. Alarm levels should be set no lower than 20%LEL for the short range unit and 10% for the long range unit. The installation must be made where it is protected from dirt and condensation. Regular routine maintenance should include cleaning the reflector tiles, re-zeroing and functional test using the test filters. 2104N4214	Excel cross-duct gas detection system, short range (0.5 to 2.5m), 4 to 20mA (source) and Modbus outputs, ATEX/IECEx, fully wired with flexible conduit, electro polished 316SS. Includes detection block, single tile heated reflector panel, Ex e junciton box with M20/M25 cable entries and 316SS mounting plate. Methane calibration only. 2104N1010	Excel cross-duct gas detection system, short range (0.5 to 2.5m), 4 to 20mA (source) and Modbus outputs, UL, fully wired with flexible conduit, electro polished 316SS. Includes detection block, single tile heated reflector panel and 316SS mounting plate. Methane calibration only. seperately. 2104N4224	Excel cross-duct gas detection system, long range (2.5 to 5.0m), 4 to 20mA (source) and Modbus outputs, ATEX/IECEx, fully wired with flexible conduit, electro polished 316SS. Includes detection block, quad tile heated reflector panel, Ex e junciton box with M20/M25 cable entries and 316SS mounting plate. Methane calibration only. 2440K0004	Duct mounting kit for use with UL approved short range cross duct systems. Comprises DX100M, junction box and flexible conduit. 157-001-100	Termination Unit, Black GRP, Ex e, 1 x M25 and 4 x M20 cable entries, 12-way terminal strip, 2 x earth terminals. Includes 4 way links, 4 x M20, and 1 x M25 stopping plugs.